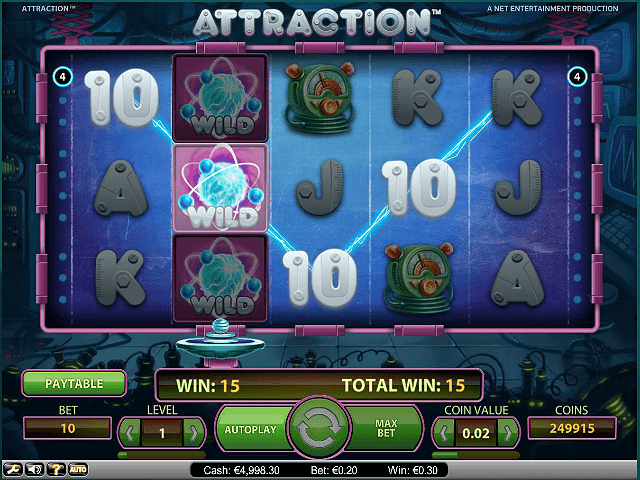 The Attraction slot game is a vivid five-reel, 10-payline video slot created by the gaming gurus at NetEnt. This electrifying slot will bring out the mad scientist in you as you try to match up all the gadgets and gizmos to win big prizes. Even if you weren't a science geek in school, you'll want to pay attention to this online slot. Study this Attraction guide carefully to discover the ways the laws of attraction can work in your favour! 200% Welcome Bonus up to C$5000 + 50 Extra Spins! 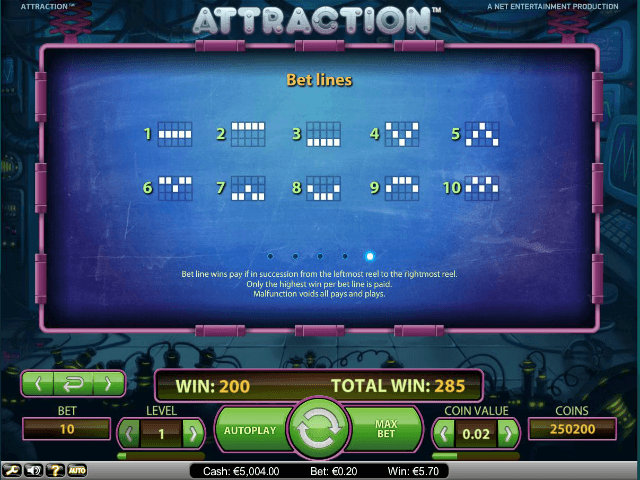 The Attraction online video slot plays more like a classic slot, but with many added features that give it an edge over the competition. For the standard symbols, the Attraction online slot uses card characters 10, J, Q, K, and A, here cut from sheets of steel and fixed together with bolts and screws. These offer from 30x to 100x the wager if the same symbol appears across the paylines. The higher-paying icons are brightly coloured lab equipment, like Geiger counters and computers, used for measuring the success of your experiments. The blue symbol pays out the lowest at 150x the initial bet, followed by green, yellow, pink, and red. The highest symbol offers 500x the original wager if five appear on one full payline. 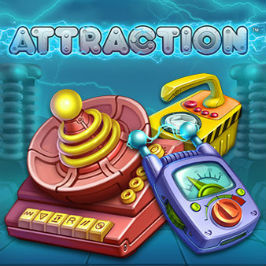 Adding to the science theme, the Attraction slot game features a distinctive Magnet mechanic, which is in play at the start of every spin. The magnet will pop up at a different point on every spin, and blast a magnetic wave along a specific row or reel. The pink magnetic wild symbol can appear on reels two, three and four in both the main game and the respin bonus round. If the magnetic wild symbol is caught in the blast from the magnet, the laws of attraction will hold it firmly in place. Once that happens, a smiling electron will appear and turn the pink wild symbol blue, fixing it in position while you gear up to make another spin. Not only that, but the sparking electron will create an extra blue wild character. As if this were not enough to increase your chances of a win, a second magnetic beam will materialise at the side of the board, doubling the possibility of another respin so that you can continue your winning streak. 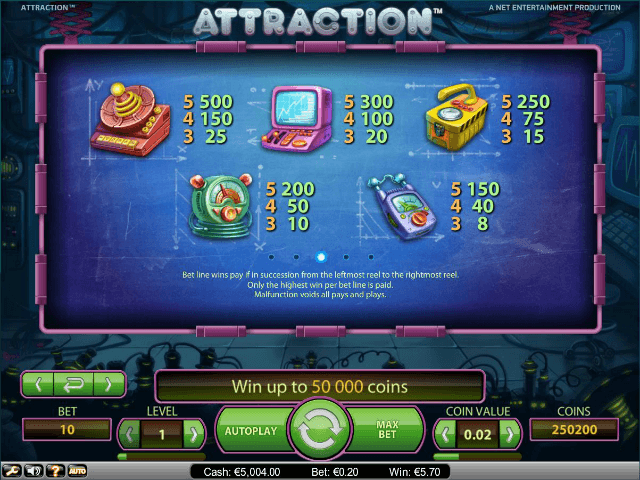 With these bonuses a frequent fixture of the game, the Attraction slot machine will keep you educated and entertained for as long as the electricity is running. 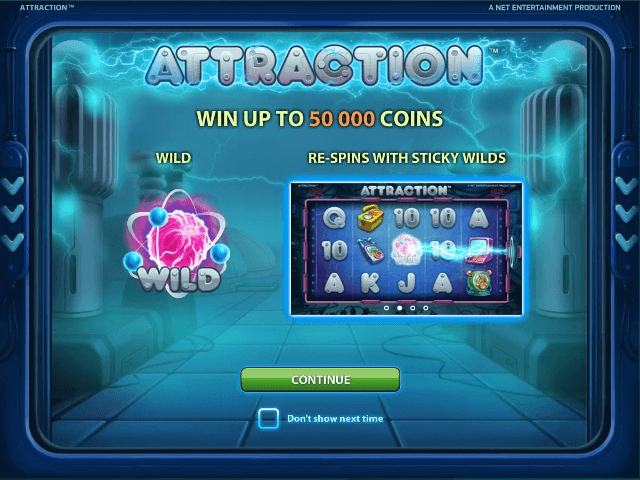 If you like Attraction - You'll like these slots too!